October welcomes the next edition of the Canton Trade Fair . 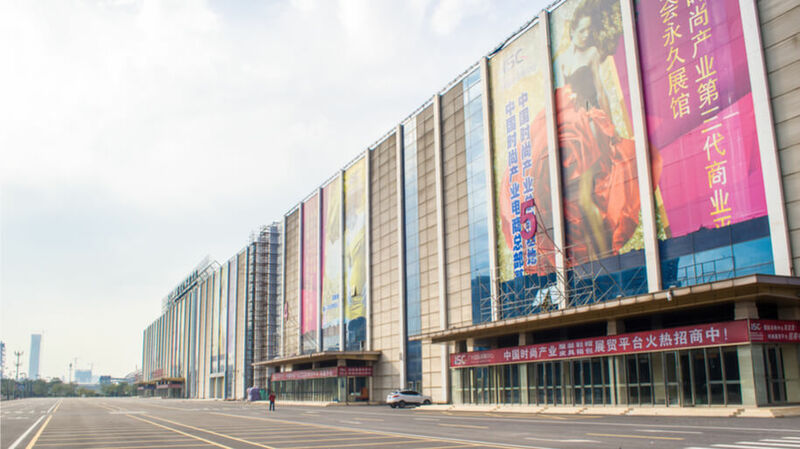 What is possibly the world’s most well known, and certainly the biggest trade show welcomes visitors from every corner of the globe hoping to do business, and gain an advantage in the Chinese market. Finding a quality hotel, close to the fair is worth its weight in gold to those planning long days at the expo without wanting to battle China’s infamously chaotic roads and peak hour public transport routes. If you’re still looking for a place to stay while at the expo, here are this year’s best Canton Fair hotels! If you’re after a high-end and luxurious stay, to rest your body and mind in between long days at the exhibition, then the Shangri-La hotel is one of the best Canton Fair hotels. Located a mere 200 meters from the exhibition halls, you’ll be able to walk to the show and back each day without too much hassle. Some experienced guests even choose to make the short walk back to the hotel during their lunch break to rest or find solitude from the crowds and attend to emails or calls in the privacy of their rooms. The staff is renowned for being highly attentive and accustomed to the needs of Canton Fair visitors. Most of the staff speak fluent English and even offer the ability to assist you with acquiring your badges for the fair. Priced on average at $570 per person each night, the rooms themselves are perfectly suited to the luxurious business traveler. Wifi is excellent throughout the hotel, although China’s usual website restrictions still apply unless you’ve set up your VPN network. The restaurant may be somewhat pricey, but the food is excellent. Surely one to consider when visiting the fair. Described as a ‘Gem on the Pearl River,’ Langham Place offers the type of modern sophistication and relaxing comfort that most business travelers seek. Priced on average around $530 each night, the rooms and hotel itself are renowned for being supremely comfortable and ideally suited to the business traveler. The staff is notoriously friendly and helpful, and like any of the best Canton Fair hotels, their employees are well trained with needs the regular visitors might have during their stay. The dining at Langham Place is worth the stay alone, their Italian restaurant, Alfresco is acclaimed to visitors throughout Guangzhou. With the fair being just over a mile away from the hotel, your distance heading into the exhibition halls each day is certainly within walking distance. The only perceived downside to Langham Place, however, is that there aren’t many other attractions within walking distance of the hotel should you wish to explore. Most visitors who’re after a bite to eat outside of the hotel, do so by hopping inside a local taxi or metro nearby. For those visiting China with the sole purpose of attending the Canton Fair, there are few better choices than the Westin Pazhou. Situated alongside the convention center, the hotel couldn’t be any more convenient for those spending long days at the fair. 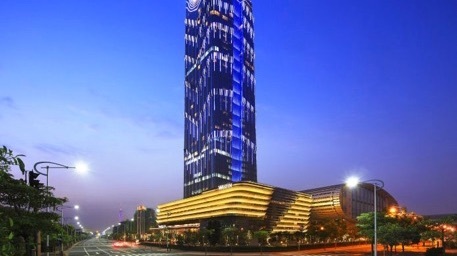 The hotel provides every luxury you can expect from any of the other of Guangzhou’s luxury five-star offerings but is priced slightly lower at an average of $380 per night. Large rooms are designed for business travelers likely to be attending events at the convention complex, meaning you’re able to get work done comfortably from your room. Although you might not want to when you notice the hotel’s fully equipped business lounge, that provides you with any of the offices comforts you might wish for on your travels. Equipped with computer workstations, high-speed Internet and an array of services on offer such as copying, faxing, printing, courier services, and express mail. There are even two reasonably sized meeting rooms that guests can make use of, with a full conference call and secretarial facilities. Although situated alongside the convention center, those wishing to explore a bit more of Guangzhou will have to try their luck at catching a taxi to visit restaurants or shopping districts. Hailing a taxi in China is tough at the best of times for foreign travelers, so most experienced visitors tend to opt for a service with English speaking drivers they’re able to rely on wherever they’re off to. Preparing for a trip east? A private transfer is the safest, quickest way to travel from airport to the city. China Car Service is a trusted transportation service helping business travelers for almost two decades. We provide door-to-door service at competitive prices. 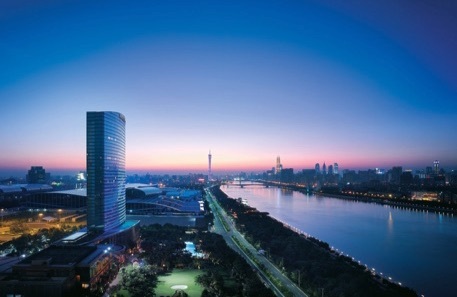 Priced at an average of $260 per person, per night compared to an average of $400 per night at some of the five-star options Guangzhou has to offer, the eStay Residence in the poly world trading center is possibly one of the better value for money options amongst the choices of best Canton Fair hotels. Located on the south bank of the Pearl River, Located just 2 km’s away from the exhibitions halls, the cheaper residence is still within walking distance each day should you choose to get in some exercise each day. The trip by car (don’t drive yourself, hop in a taxi or use a car service) would only be a few minutes ride. Allowing you the comfort and convenience to focus on the fair and any activities you may wish to get up to whilst attending the world’s largest trade show. The rooms are well equipped for those traveling on business, although not all of the staff can speak English, meaning accommodating any other Canton Fair related info or requests can be tricky. 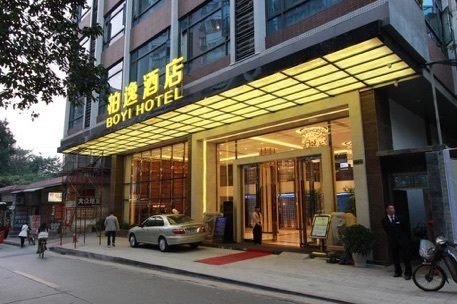 Rounding off the list of best Canton Fair hotels, is the Boyi Hotel. Proving popular with small business owners or travelers seeking value for money during their visit to Guangzhou. The rooms are incredibly affordable at an average of just $200 per person each night. 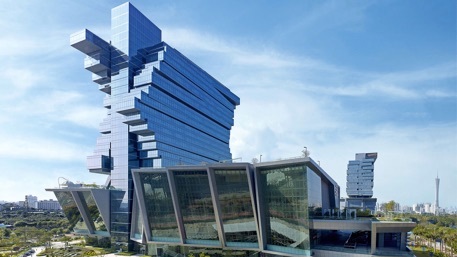 Situated not far from one of the tallest buildings in Guangzhou, the Poly World Trading Center, the 4 star Boyi is just short of 2 km’s away from the convention center that plays host to the Canton Fair. Still, within walking distance should you choose to, although using a car service is probably the easier option. Although finding English speaking hotel staff can be tough, a big bonus for many of the travelers who use the Boyi Hotel each time they visit the fair is some favorite local restaurants just around the corner from the hotel itself. The Canton Fair can offer some exciting opportunities for those attending every year. Planning ahead is a good idea, and consulting a site map of where the vendors most likely to benefit your business can save you hours of aimless walking around and ultimately prove valuable to your business! Do you have a suggestion of best Canton Fair hotels? Where are you staying this year? 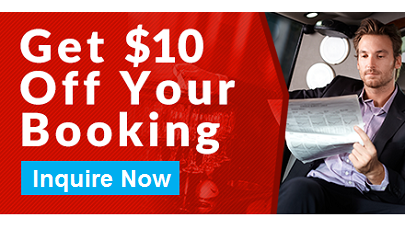 Share your experiences by leaving us a comment below and take advantage of our online discount when booking your next car service ride!